We are starting series called “Success story”. 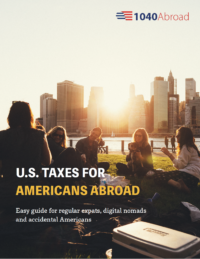 We share how 1040 Abroad solved the tax problems, which our clients were facing. Today we want to tell you Brian’s story. Brian is a U.S. citizen who has been teaching English in China, South Korea, and other places. He never filed a U.S. tax return and is now considering an online venture. After reading news articles about the U.S. government taking steps to revoke passports to those who are delinquents (owing more than $50,000 of tax & penalties), Brian wanted to come into compliance. At 1040 Abroad we advised him on how to get compliant for his past years. He only had to file 3 years of income tax returns by using the Streamlined Foreign Offshore Procedures. While he didn’t have any tax owing thanks to the Foreign Earned Income Exclusion, he would have otherwise been liable for penalties on his FBAR filings. We also advised him on how to have the structure to run his online business. Thanks to 1040 Abroad’s understanding of these advances tax issues, he now has the peace of mind. He knows that he is fully compliant and that his passport is safe. Now Brian is proud to have the peace of mind that his tax situation has been dealt with correctly.